Double-Wide I.P.A. | Boulevard Brewing Co. The classic India Pale Ale is a traveler’s beer, aggressively hopped to withstand the long, hot ocean voyage to the British East Indies. Our Double-Wide I.P.A. also travels well, and is right at home in the most exotic ports of call of the Midwest. While this modern-day prairie schooner may not resemble a graceful sailing sloop, our liberal hopping regimen does make her virtually “twister-proof,” with toffee and caramel notes balancing out the lingering bitterness. Enjoy this beer fresh to best appreciate the complex blending of hop aromas, ranging from minty to citrusy, with subtle hints of pine. Frothy white head; insane lacing. Delicious rich mango jam nose. Before my first sip, I'm very excited. Medium mouthfeel, leaning towards heavy. The mango jam flavor is balanced with substantial but not overbearing malts; a truly unique and delicious DIPA. I look forward to having many more. [Original rating 2012-09-02] Pours cloudy copper with a thick off white head that lasts. Aroma is...faint. I’m not smelling much at all. A little spent malt, not much hops aroma. Maybe a little fruit and straw if I use my imagination. Taste is well balanced, lots of malt, kind of sweet at first with a bitter finish. Alcohol is well hidden but it warms on the way down so you know it’s there. A solid DIPA but not the one I’d reach for if I had my pick, which I don’t because I live in Utah now. Pours a super golden amber and leaves more of a slightly bronze looking colored body with a one and a half finger white foamy head that rises to a sort of rocky looking lumpiness that wants to overflow but nicely maintains a classic awesome sustained head that just hovers over top of the glass (wow, what a nice show); the aroma has an initial smell (actually smokey, but quickly goes away, unsure where that came from and unaware if that was intentional), anyways, it leads into a the "typical" DIPA smells of citrus and pine coming through in a nice sweet sort of way followed by a slight bitterness; the taste is mainly sweet (there’s an element that wants to be slightly bitter, but it really comes across mainly sweet through the citrus/pine aspects). A very citrus-like aftertaste, dry malty finish and comes across pretty combined - I like it; on the palate this one sits about a medium on the body with a semi-sessionable aspect to it (as far as any DIPA really can be), carbonation comes across like a good DIPA (there’s the harsh bittering pounding on the mouth and tongue but still not overdoing it just to let the malty aspects show their face); overall - I say this is a good DIPA that I would have again, good job Boulevard. Retired! (Chuckles) Oh, boy. Yeah. I know this one is retired and the one I found is definitely out of date. I can just make out the expiration date on the bottle and it appears to have "expired" sometime in June of 2013. So, this little fella is a little over the three year mark too far. I vaguely remember this beer fresh, I had one maybe a year before they pulled it. I remember thinking it was pretty good, I wasn't necessarily blown away but it was a memorable beer. A bit malty, a bit spicy, nicely bitter. But not in your face. Look: Has a nice, deep amber, orange sort of color. A good frothy, deep cream color head to it that slowly dissipates and clings nicely to the glass walls. My only complaint is pretty mild. It has a lot of "stuff" just, hanging, fully suspended and motionless when left alone, floating in the beer. It is kind of strange. Though, slightly impressive because it is perfectly still… just hanging there, like a lava lamp suspended in motion. I'm beginning to trip out, man. Smell: Wow. I am actually really surprised by this. For how old and out of date this little fella is, I get a hint of oxidation, a bit of smoke, and a bit of soapy hops. It has a dried orange peel sort of sent to it with an herbal pine that is most obvious. Do I sense, barleywine? Taste: Yeah, that last comment sums it up. Barleywine. This double IPA has changed it's spots in my opinion. The hops are dead. There is a faint bitterness right at the back end but it is minimal. There is a fruity tea tone to it, I do get a bit of dried apricot, maybe a bit of dried apple as well. I also get a pine resin touch right after the initial fruitiness. The malt is well blended among the tea/fruit thing and bears a bit of oxidation with the light earthy, caramel taste. I've had barley wines that taste almost identical to this in so many ways. One that comes to mind is Old Foghorn Barleywine. Feel: The feel is a perfect medium body. The carbonation is still good and helps crisp it up whereas without it I could see this becoming a very sticky and cloying mess. Very smooth at this point, a pinch oily. Overall: Needless to say, I may be going back to this grocer to see if I can track down one last bottle that may have been shoved to the back. This is actually really good and probably more memorable than it was fresh. Irony of ironies. Of course, as I frequently mentioned, this beer seems to no longer have many notes of a double IPA. It has transformed into a barleywine. I like barleywines better. That is just my opinion. I'd say, if you see it, try it. Be amazed. Though I have my doubts that it will be easy anymore to find this on a shelf like I did. This beer has been retired for some time now. A few years at least at this point. Exploding orange out the bottle, looks good except for the substantial amount of haze for style, had the dry hopping made up for it, all would be forgiven, but it wasn't. it was mostly bittering hops when you pulled and pulled at the nose. Pine and grapefruit, its a big bitter dipa the likes of which we've seen over and over. Lemon, grapefruit, caramel unsweetened. Format is a little suspect, don't know why we need 750s of dipas. I mean, its good, not great. Pours from a now capped, not corked, bottle. Additionally, this bottle was purchased in 11/2014 and drunk in 3/2016. Best by date is 12/2014. Pours a beautiful orange honey color topped with a big tan head. Retention is as solid as the very thick film looks. Goodly amounts of lacing remain. Cloudy because I like the yeast (my 2nd favorite life form) in my brew. Smell is easily picked up from 2 feet away, sweet, herbal & grassy hop notes, malt, bread, pepper all playing equally strong. Great balance! Taste is exactly what the nose promises, a well-blended mix of herbal/grass, pepper, malt, bread and a gin-like alcohol note (I like gin) all trying to get your attention. Nicely done. Just a tic over medium-bodied with a restrained effervescence. Warming after the swallow. Quite smooth for an IPA, even a DIPA. I like it and would gladly buy it again, were it still in production. And considering how well it stood up to life in my closet, the "best by" date is very conservative. 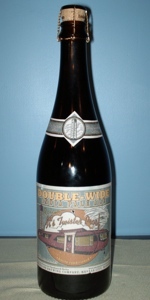 Double Wide IPA is a unique sort of Double/Imperial beer/ale, whose taste really sort of sets it apart from the Double/Imperial crowd in general. The body of the beer is somewhat thick, not thick, not medium thick necessarily but about 3/4 of the way between light and medium thick one might suggest. The taste is sweet, but underlies a sort of hoppiness if one will. The froth or carbonation of this beer, is sort of normal to somewhat more than normal in regards to Double/Imperial beers in general I would say. The ~squash colored froth bubbles out of the bottle upon opening it, and upon tasting it/smelling it, one senses a sort of pleasant sweetness that one does not normally get on first impression from a Double/Imperial style of beer/ale. Overall the taste, is perhaps somewhat reminiscent of a blanket of semi-sweetness covering a bundle of hoppiness. For, the sweet, pleasant flavor/aroma of this beer covers a sort of hoppy richness that is subtle, and not as demanding of one's attention as are some Double/Imperial style beers/ales. I would say overall that this is a very drinkable and pleasant beer. It might even be a good beer to have before casual athletic events like golf etc. for its sweet refreshing nature accompanied by it somewhat hoppy semi-thickness make it a very drinkable and refreshing beer. Double-Wide I.P.A. from Boulevard Brewing Co.